Lushus Jogging | Alley Cats Standard Figurines | One Price Low Flat Shipping! 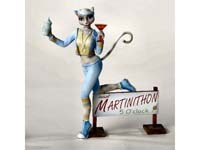 From the Alley Cats Hobbies Collection by Margaret Le Van, Lushus Martinithon Jogging. Made of hand-painted resin. Measures 7.5 inches tall. Designed by Margaret Le Van, manufactured by Kurt S. Adler Inc. 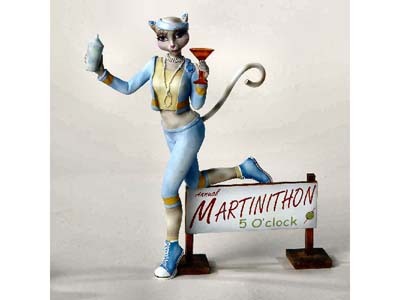 Wearing a blue and yellow jogging suit, Lushus holds a martini in her hand and stands next to a sign which reads, "Annual Martinithon 5 O'Clock." Purr-fect cat gift for any feline lover!